Denon AVR-4311 review | What Hi-Fi? Goodness knows it’s tricky to deliver a home cinema product with a Unique Selling Point. The Denon AVR-4311 does at least have a Fairly Unusual Selling Point: it’s one of the very first items to come through our testing rooms to be compatible with Apple AirPlay. If you’re the owner of a) an iPhone, iPad or Touch, b) a home network and c) a spare £40, you can stream audio to the Denon in the most painless and elegant fashion. It’s a nice touch – although a glance at it and its price-tag lets you know there’s a bit more to the AVR-4311 than just that. 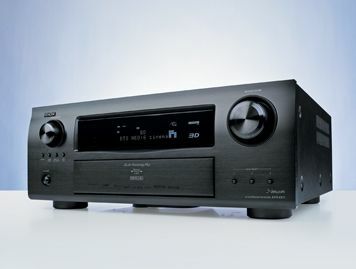 As befits a receiver of this price and this position in the Denon hierarchy, the 4311 is positively bristling with features and functionality. Nine channels of 140 Watts each should be ample (and there are pre-outs to supply a hair-raising 11.2 set-up if it isn’t), as should seven HDMI inputs and a pair of outputs (all 3D and ARC compatible). Wired networking is supported, giving access to internet radio and streaming of formats as impressive as FLAC HD. and as well as a learning remote control there’s a remote control app for your iThing available for free. The Denon will supply three separate zones, has elegant and thorough on-screen menus and sets itself up commendably accurately via the supplied microphone. It’s similarly wide-ranging when it comes to movie sound. Inception’s DTS-HD Master Audio soundtrack is served up on a deep, wide and tall soundstage, the generous dimensions of which offer plenty of space for the Denon to show off its pin-point effects location, assured imaging and effortless drive. Dialogue is isolated well, so inflection and detail are readily available, but it’s also incorporated seamlessly into the overall sound. There’s no sense that treble sounds might ever become problematic, and the 4311 dispatches the considerable dynamic fluctuations of the soundtrack without breaking stride. This confidence is rather more qualified where stereo music is concerned – in fact, it’s music that really throws the Denon’s one major difficulty into sharp relief. One listen to Grinderman’s Palaces of Montezuma confirms it: for all its amazing powers of focus and imaging, the 4311 just can’t help but overstate low frequencies to the detriment of overall neutrality. What at first sounds like an excitingly chunky and forthright presentation is, before too long, revealed as a rather muscle-bound, bass-forward signature. The low end hogs the limelight somewhat, and it’s far from light on its feet. A bit like a ballet dancer forced to perform in Doc Martens, the Denon is weighed down at the bottom end and consequently isn’t as manoeuvrable as it might otherwise be. Of course, for some people walloping bass is the very essence of home cinema, but we know the same money spent elsewhere buys a deal more even-handedness than the AVR-4311 can offer.